Well, the college basketball weekend really did me in. The celebrations and beers and shots after the Gators advanced to the Final Four contributed to a vicious hangover of epic proportions. I usually begin to (try to) quell the hangover with the tried-and-true Alka-Seltzer. It’s been around since 1931, so you know it’s the real deal. Unfortunately, I was out of Alka-Seltzer, I had no Gatorade around, and plain water wasn’t cutting it. 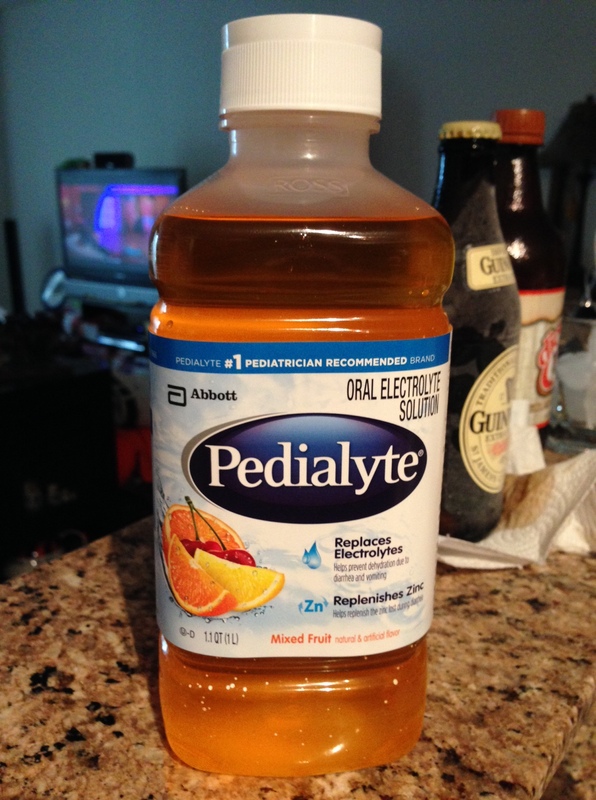 So I decided to try another supposed hangover cure that some friends rave about – Pedialyte. So I somehow got off my couch – the only driving force being maybe feeling better after I drive to find this stuff – and I make my queasy way to Publix. Pedialyte is an oral electrolyte solution for babies with diarrhea, but I’ve heard wonders about its qualities as a hangover remedy. Some swear by it, while others say it’s an urban myth, so I thought I’d give it a try with this doozy of a hangover. I went with the mixed fruit flavor – the consistency is a little thicker or more syrupy than Gatorade, and the flavor left more to be desired. Then again, it’s for babies, not grown adults with a more discerning palate. I must have really did a number on myself over the weekend, because I didn’t really feel much better after chugging the liter of Pedialyte. The only thing that made me feel better was good ol’ hydration and time.